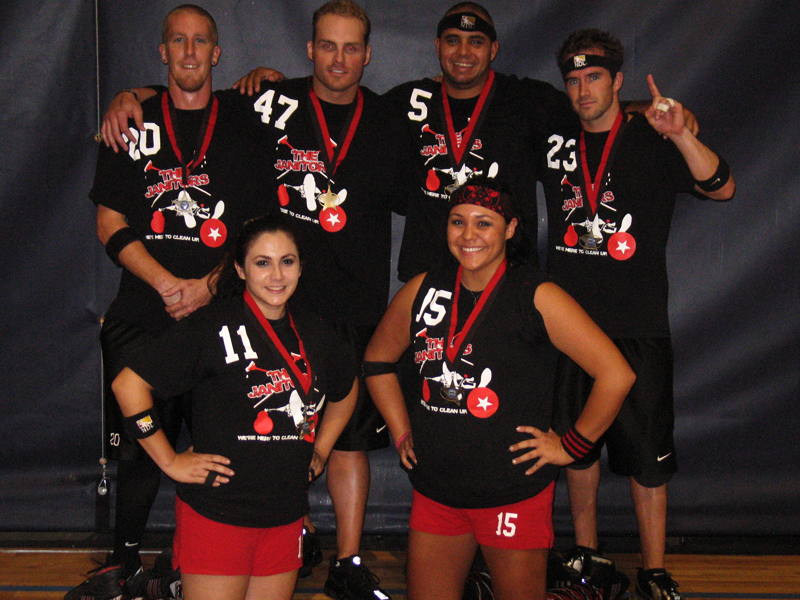 Announcing the winners of the 2008 Dodgeball World Championship. What an incredible dodgeball weekend. 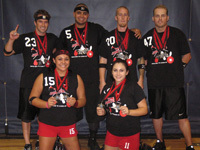 Forget the Olympics, Las Vegas was the place to be on 8/8/08 as dodgeball teams from around North America came to compete. Teams showed up from around the country and Canada. We saw teams from Florida, Alaska, Arizona, California, Oregon, and Massachusetts, just to mention a few. But the biggest winners were the fans who were treated to epic match-ups between returning champions and matches between young guns proving they have what it takes to play with the big dogs. The noise was incredible as Rise of Brutality and Triple-A hit the court. Both teams brought a lot fans with them, and they weren't disappointed as these two teams battled it over the Stinger division title. We were all on the edge of our seats as Rise of Brutality took their final victory. After a grueling Open Stinger match. The 2006 open division champions Triple-A faced the defending 2008 Co-ed Division Champions, the Portland Reign. 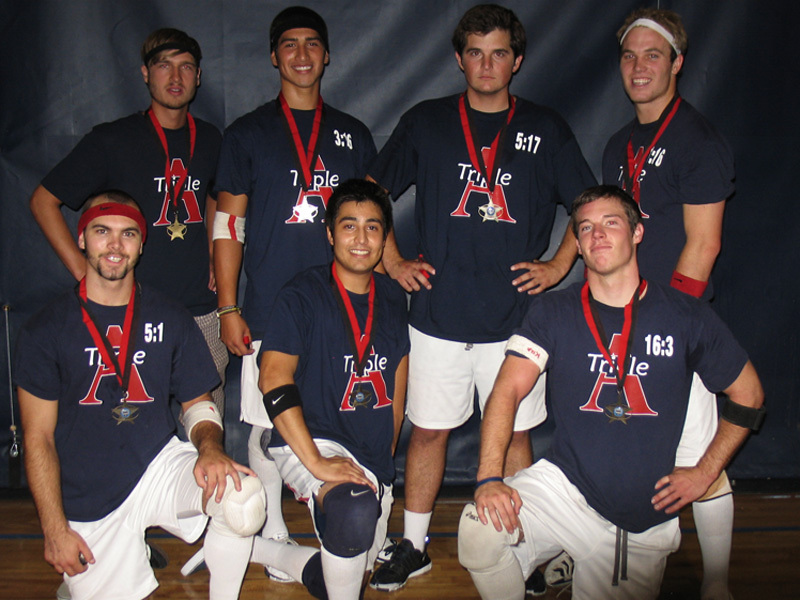 In a wild match with fans on their feet screaming the whole game, Triple-A prevailed taking home the Open 8.5 Championship while making a little dodgeball history. Defending their 2007 title the Portland Reign was back. 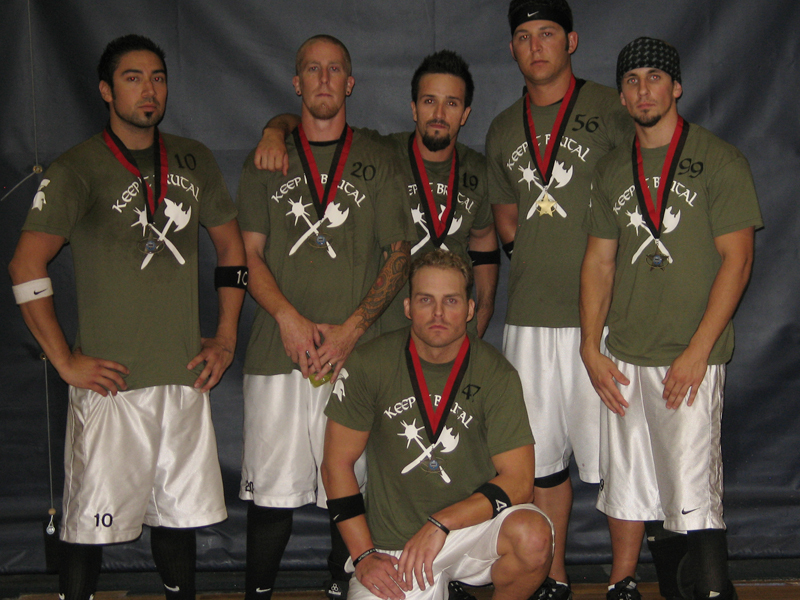 This time facing the Janitors from San Diego, a West Coast battle for the Dodgeball supremacy. The balls flew fast and furious as the Janitors, worked together to upset the reigning champs. Congratulations to the Janitors our 2008 Co-ed Stinger Division Champions. These teams just can't seem to get enough dodgeball. For a second time the Janitors faced off against the Portland Reign. A revenge match for Portland and they looked just a strong as ever as they entered the court. The Janitors hyped from their Stinger division win were on fire and pulled off a 2nd victory of the weekend the and took home the Co-ed 8.5 Division title. The Last Dodgeballer Standing was the hit of the weekend. Over 150 players moved around the court while Dodgeballs flew from every direction. It was chaos! It was a blast! It was everyone for themselves and there could be only one. 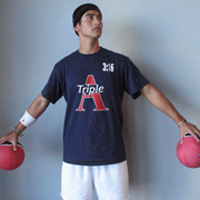 Congratulations to Jonny from Triple-A, you're the one, the 2008 Last Dodgeballer Standing. Watch for Jonny's silhouette on next years LDS Logo as we honor his skills along with previous winners on Last Dodgeballer Standing Belt. There are tons of photos and more to come. 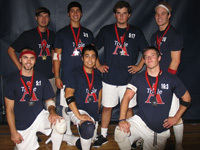 So keep an eye on the www.dodgeballworldchampionship.com website as it transforms into the DWC Recap site. Just give us a week or so to finish updating the website. Thanks to all the teams who participated. A special thanks to our pro players who volunteered to help ref, set-up and tear down on Sunday. We would also like thank the members of the Dirty Girls for all their help and lastly, the thanks to the staff of the Tarkanian Basketball Academy for the use of their facility..
Hey dodgeballers, have photos or something you would like to share about the 2008 DWC? Give us a holler at info@nationaldodgeball.com we love to see what you've got. We hope to see you all on tour and at next years DWC.